vFeed Professional Services Update – Sept 2018 – vFeed, Inc.
As announced this last June, vFeed IO is the first company to map the MITRE ATT&CK initiative with the CVE identifiers. This will help leveraging the vFeed database to validate your controls against vulnerabilities mapped with the ATT&CK identifiers. And to improve the reliability of this approach, we have extended the support to ATT&CK by adding missing identifiers from the original MITRE sources. 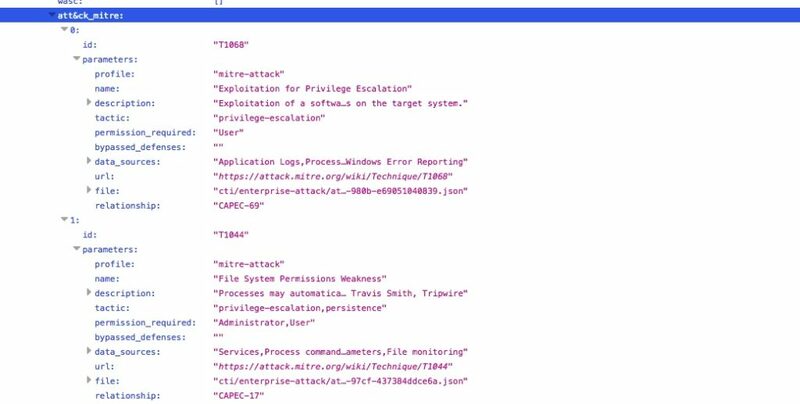 The case of APT28 (Russian malware that targets gov and military organizations) was referred to by 3 CVEs (CVE-2014-4076, CVE-2015-2387, and CVE-2015-1701) to escalade privileges in Windows Server 2003. Now, vFeed reports the associated ATT&CK identifiers. The following sample from CVE-2014-4076 shows the ATT&CK ID related to this vulnerability.